Welcome to Boozinette. This is the Whiskey Mango Foxtrot. In a small saucepan, bring all ingredients to a boil. lower heat to a simmer for five minutes. Strain, contain, let cool and refrigerate. Use to freshen up any beverage that’s tasting not-so-fresh. 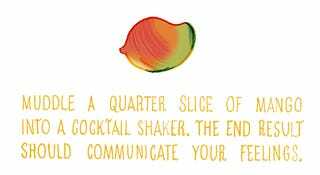 Muddle a quarter slice of mango into a cocktail shaker. The end result should communicate your feelings. Pour all liquid ingredients over mango and add ice. 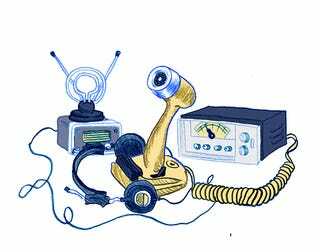 Shake like a jumbled shortwave transmission for 10-12 seconds. 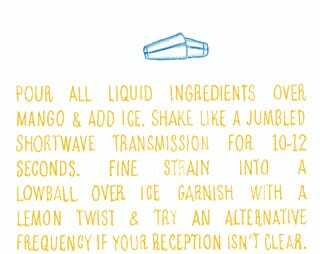 Fine strain into a lowball over ice, garnish with a lemon twist and try an alternative frequency if your reception isn’t clear.